Photograph by Nicole Axworthy © 2015. Used with permission. I was truly excited to receive my copy of Ricki Heller’s new book Living Candida-Free: 100 Recipes and a 3-Stage Program to Restore Your Health and Vitality . Ricki is a friend I met at the Dole Salad Summit a few years back and we keep in close touch. 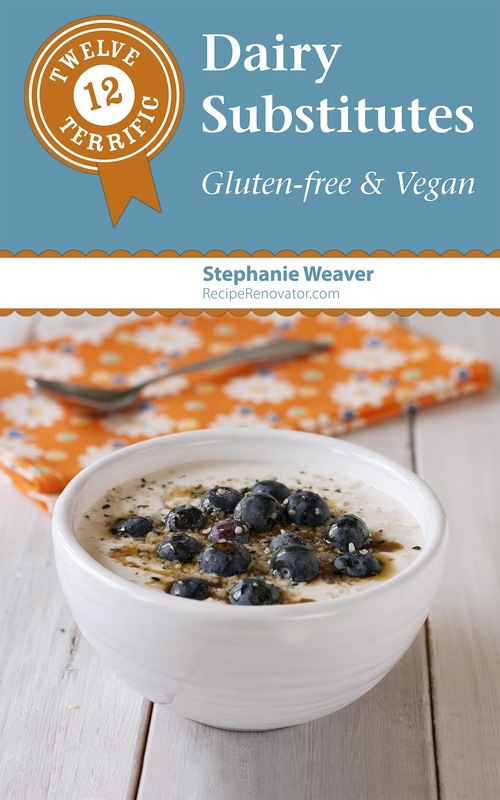 Her last book, Naturally Sweet & Gluten-Free was amazing, and I was so happy for Ricki to get a book deal with Da Capo/Lifelong to produce her next book, a step-by-step approach to reducing candida albicans in your system. Ricki has been living this specialty diet for many years, so she’s truly the expert at making it work. I’ll be reviewing the book on Wednesday. 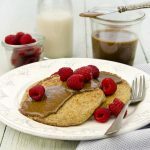 Today I’m happy to share her recipe for single-serve pancakes which we tried yesterday. The “single-serve” concept makes sense if you are the only one in your household that’s following this diet… and if you mixed up the dry ingredients the night before you could easily do these before work. We both thought they were tasty, almost muffin-like. If making them again I would likely triple the recipe and make a bunch, as they freeze well according to Ricki. Mix the dry ingredients the night before and these come together fast! In a [clean and dry] coffee grinder or blender, grind the chia, quinoa, buckwheat, hemp seeds, coconut flour, baking powder, and salt to a powder. Pour the mixture over the wet ingredients in the bowl and stir to blend. It will seem a bit too thick for pancake batter and more like a soft cookie dough. This is as it should be. Heat a nonstick skillet over medium heat (brush with coconut oil if it has a tendency to stick). Cook until the top begins to dry out (about 4 minutes); flip and cook for another 3 to 4 minutes. Serve immediately. Calculated with unsweetened almond milk, unsalted almond butter, and quinoa. Use sodium-free baking powder to reduce sodium more. May be prepared in advance and frozen. Will keep, frozen, for up to 3 months. 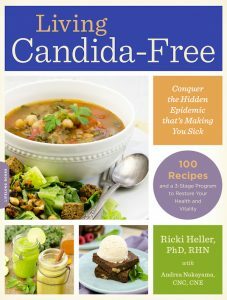 From Living Candida-Free: 100 Recipes and a 3-Stage Program to Restore Your Health and Vitality by Ricki Heller. Reprinted with permission from Da Capo Lifelong, © 2015. 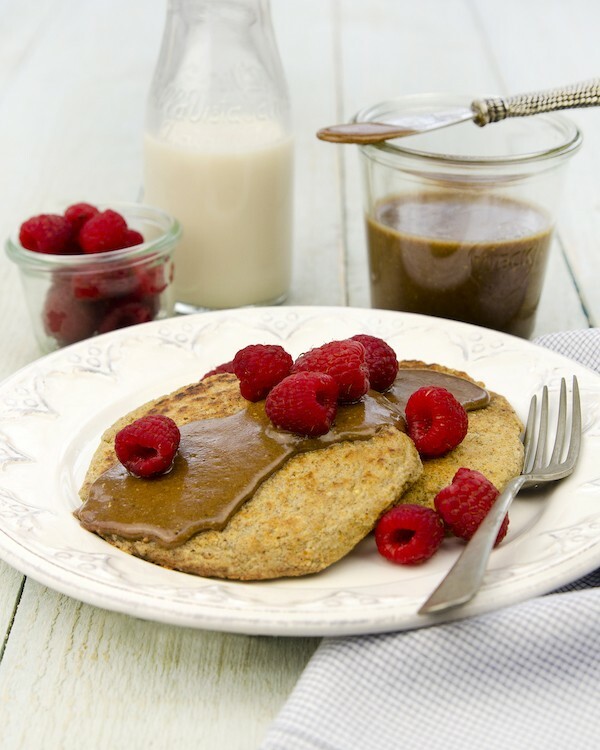 Is there a recipe for the gingerbread pecan nut butter to go with the pancakes? These look so healthy. What a great way to start the day. Yes Katie and they were very tasty.